Was soll ich aus dir machen, Ephraim (What shall I make of you, Ephraim), BWV 89, is a church cantata by Johann Sebastian Bach. 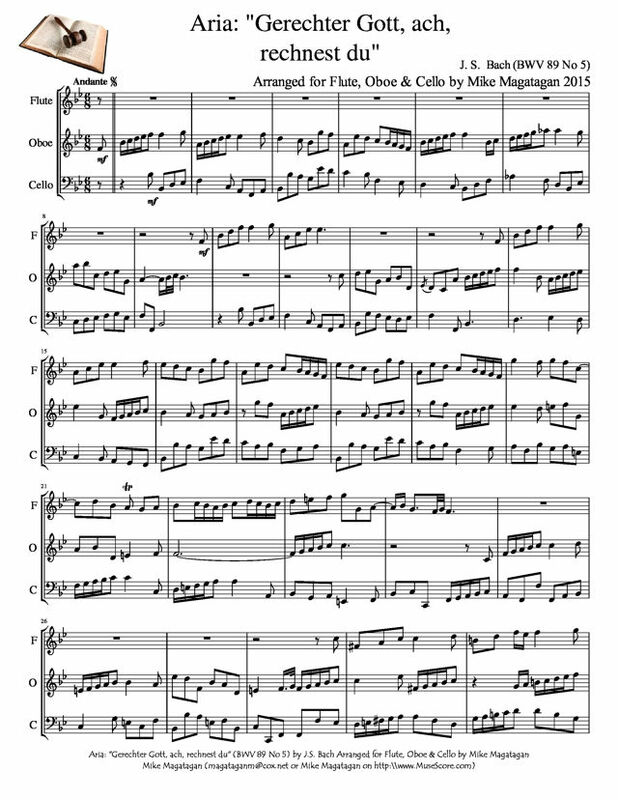 He composed it in Leipzig for the 22nd Sunday after Trinity and first performed it on 24 October 1723. The unknown poet of the cantata text stressed the opposites of the gospel, God's justice versus unjust men. The text begins with a related quotation from the prophet Hosea, Hosea 11:8. The next two movements, recitative and aria, reflect the sinful condition of man, another set of recitative and aria deals with God's mercy. The closing chorale is stanza 7 of "Wo soll ich fliehen hin" by Johann Heermann (1630), which Bach would treat completely one year later in his chorale cantata Wo soll ich fliehen hin, BWV 5. The cantata is scored like chamber music. Only the chorale is set for four parts; the alto voice sings of man's sin, the soprano of God's grace, and the bass is God's voice in the opening movement. On some copies of the parts, the movement is marked aria but we don't know if that marking is authorized by Bach. Formally it has some characteristics of an aria, such as a ritornello to open the movement and frame the text sections, and some aspects of an arioso, for example the free setting of the sections. The last section, which speaks of God's "meine Barmherzigkeit ist zu brünstig" (too fervent mercy) is embedded in the ritornello, then the ritornello is repeated once more. 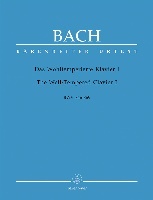 One motif in the ritornello is similar to one in the chorus "Lasset uns den nicht zerteilen" from Bach's St John Passion and may illustrate undecidedness in both cases. The following three movements, two recitatives and an expressive aria, are only accompanied by the continuo, the last aria also by an obbligato oboe. The closing chorale is set for four parts; the melody in the soprano is doubled by the horn, the oboes, and violin I. 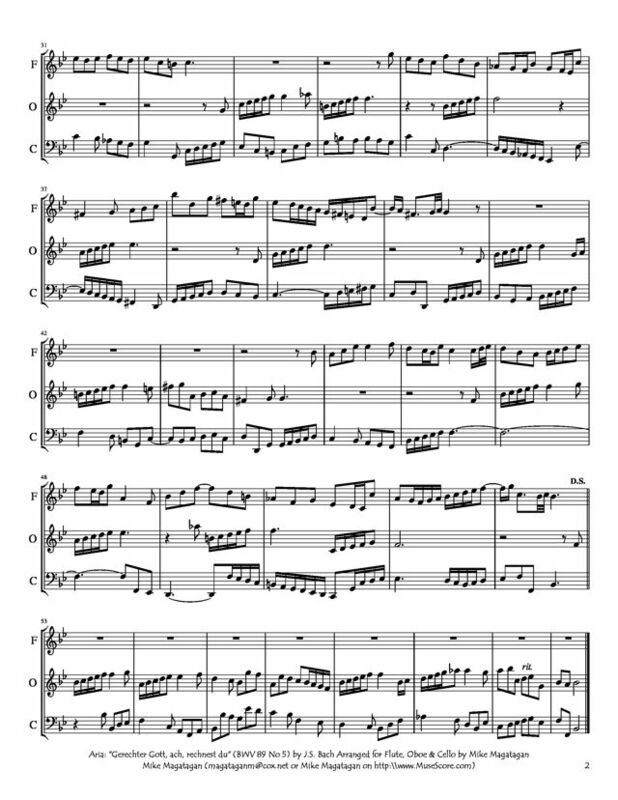 The cantata in six movements is scored for three vocal soloists (soprano, alto and bass), a four-part choir only in the chorale, horn, two oboes, two violins, viola, and basso continuo. I created this arrangement of the third Aria: "Gerechter Gott, ach, rechnest du" (Righteous God, ah, do you judge?) 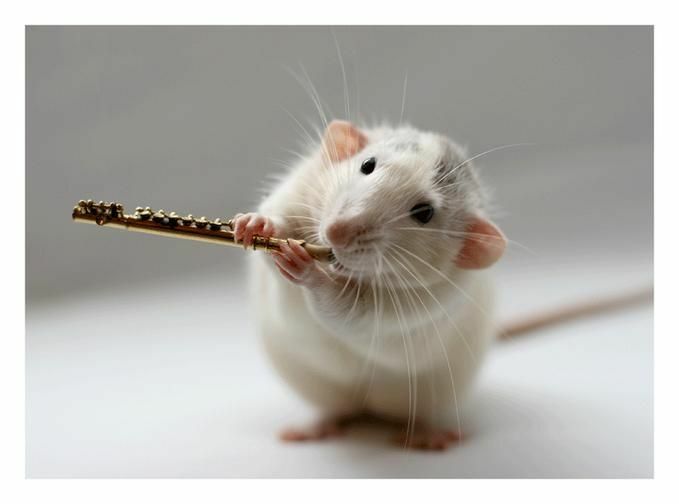 for Flute, Oboe & Cello.